Events Calendar — Taranaki Car Club Inc.
TCC members will be able to gain points for this season (Last chance to gain points), It will be worked out from both days times combined and points allocated from there. Please note if you enter both days the Entry Fee is only $170.00. If you only enter one day, the Entry Fee is $90.00. I wasn't able to convey that on Possum, so please make sure you only pay $170, not $180 for both days. There's no Hard Copy Entry Form. Everything is done through Possum. Make sure your profiles are all up to date. Then it's easy, peasy for both you and I!!! Please, also, don't leave paying until the last minute as it makes it harder for me this end. Its that time of year again were we celebrate the years racing. it may have been a small competing field this year but it was still a close and competitive bunch. It will be very similar to previous years with a meal, prize giving and great company. Everyone is welcome, Bring your friends and family along to enjoy the night. At the PLYMOUTH HOTEL AT 7 P.M.
(NB) This notice is a new one as there were insufficient members at the previously advertised one to be held at the Auto Lodge on Sunday 24th February at 5 p.m. – 15 members only turned up. The constitution states - ”That the Club have at least 20 members present to make a quorum -(the more the better) This is your Club and also theirs. Matters arising from these Reports. Entrys are now open for Eze Wash Naki Street Drags 2019, Both MSNZ and NZHRA see the below links to enter. Vehicles with WOF & REG and enter under NZHRA and Non legal cars can enter under MSNZ. The teo sanctions wont be running together but in there own groups. Is event one of a three event sprint series to be hosted by Taranaki Car Club Inc. This three race series compromises the following events. Event 2 – Sunday 25th November 2018 Ross Graham Motors Paritutu Street Sprint. Should a competitor be forced to withdraw from any or all events a refund of 75% of the entry fee for that event will be made provided notification is received in writing or by email no later than 24 hours prior to the start of the event. Competitors wishing to enter the entire series will have the option to do this on the invoice generated via the Possum website when entering the first event. If such an occurrence happens to a competitor who has qualified for, and received, the petrol voucher discount this discount will be deducted from fees refunded. Two days of motorsport action! Reminder to all Taranaki car club members to gain club points you need to compete in both days to get collect points. Event 2 – Sunday 25th November 2018 Paritutu Street Sprint. The first 20 entries received and paid for the entire series by the close of Priority Entries at 5:00pm Wednesday 10th October will receive a refund of $50.00 in the form of petrol vouchers on the day of Event 1. Updated on our club track day. With the latest changes to Hampton down health and safety regs which effect the running of our fun day we have made the decision to move the event to Bruce McLaren Motorsport park in Taupo, New date is 22nd of September one week earlier then originally planned. This day will be combined with Dual car sprints and Drifting. For entrys froms and information on PARIHAKA Road Gravel HillClimb please click on the STCC tab on the home page. Car Trial, (While not a speed event, it still carries "trials points" and Clubmans points). BYO food and drink, there will be a BBQ at the prize giving at the destination venue, should be all done by 4.40pm ish. Assemble at the Molesworth Car Park, Molesworth Street NP, (opposite Todd Energy offices), before 1pm so documentation can be carried out, there is an entry fee, it is a Motorsport NZ permitted event, open to everyone , do not need to be a club member or hold a competition licence. For entrys froms and information on Westend Hire Stratford Street Sprints please click on the STCC tab on the home page. Thank you to all who have given there time up to help with the 2018 Taranaki Tarmac Rally to date. Unfortunately due to a number of reasons Taranaki Tarmac Rally will no longer be happening this year but will be replaced by a Rally sprint on the same day. Entrys are live on Motorsport NZ Posum website, You will need to log in to enter. Its that time of year were we celebrite the years racing with our follow competitors. Meal on the night will be a yummy BBQ. All 2017 members come along and enjoy a beverage or two, while talking about how little we spend on our race cars. Non 2017 club members will be $20 each. Were taken advantage of the great south Taranaki roads and joining in with South Taranaki Car Club's Double hill climb weekend. To recevice TCC points for 2016/17 season, You will need to complete at least one offical run each day for your times to be combined to give you and overall result to collect TCC points. Taranaki Car Club are joining in on the South Taranaki fun. This Hill Climb will be part of our points season. Any questions contact Helen Cameron and please send your forms to South Taranaki Car Club. Were mixing it up this year, in stead of having the AGM on Wednesday night like we have done previously we have decided to move it to saturday arvo and add in a social part to it. Social side - Going to Hillborough Holden museum at 3.30pm, A look through the museum and play mini putt you can choose to do both or just one. Please RSVP to Larni or Garnett so we know numbers. Event postponed until early in the new year. To collect club points you will need to compete in both days in the same class. We did this style of event a few years ago, it gave the opertunity to thoughs who dont want to enter a street sprint or hill climb. There will be 3 mini-series run with in the day with the total added up for the overall topped skilled driver of the day. Each person will be given two chances at each course. 1st place will get 10 points, 2nd place 9 points, 3rd place 8 points and so on until you reach 10thplace every playing after that gets 1 point. Each cone/barriers that is hit will get 1 point deducted. (Maximum 5 point deduction). -can anyone do it :Yes as long as you have a licence. Once a year the club hires one of the many tracks we have available here in the north island to give the club members a chance to have ago on a circuit. Raceway motel Fielding have come on board with us and are giving club members a discount on there stay. Documentation & Scrutineering for all New Plymouth based cars will be at AVS on Thursday July 27th between 6pm and 7.30pm. Please don’t be early. All other cars will be checked at the venue between 8.15 and 9.15am on Sunday 30th July. Le Dejeuner will be open for food and drinks through out the day. Note: You must have lights installed in your vehicle for this event. Were mixing it up, Get the polish out its time to show off your ride! 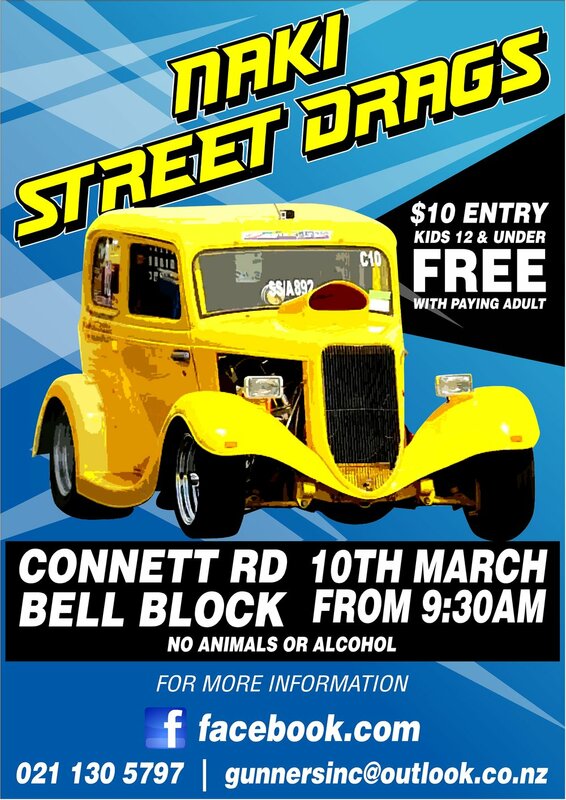 Wanganui Car Club have a dual weekend coming up two tarmac hill climbs. All 2016 members come along and enjoy a beverage or two, while talking about how little we spend on our race cars. There will be a lamb on the spit, with all sorts of sides. Note: Not a TCC Club Points round. Please send entry forms to Helen Cameron.